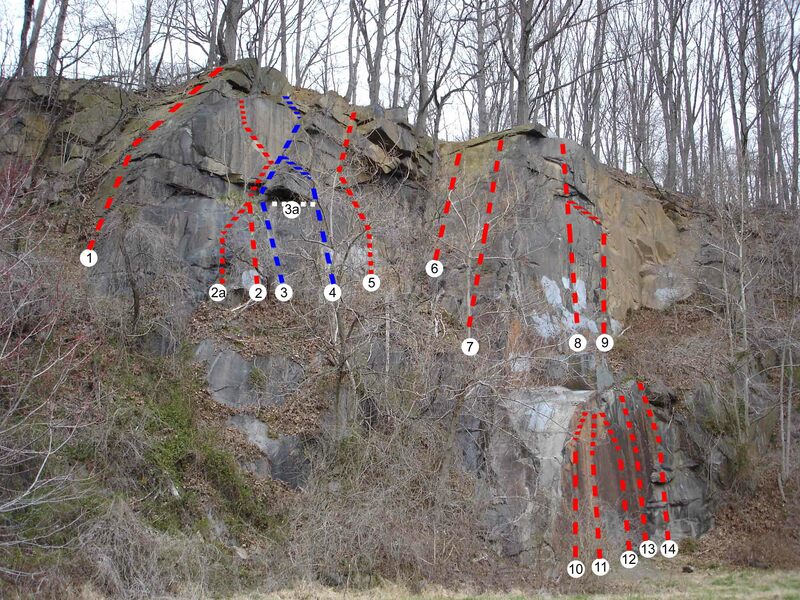 The main rock climbing is in a former quarry for Wilmington's famous blue rock. Climbing requires a permit from Delaware State Parks, which is free. Obtain the permit from the Brandywine office or the Blue Ball Barn office. The Blue Ball Barn office has weekend hours. Here is the Blue Ball Barn location on Google maps. Note that parking in the Blue Ball Barn lot requires a park entrance fee or a state parks permit. You may be able to park nearby and walk to the Blue Ball Barn to avoid the fee. State park e-mail list: There is a Wilmington and Alapocas state parks e-mail list where park activites and announcements are posted. Join the e-mail list by sending an e-mail to join-de_parks_wilmington@lists.state.de.us with a subject line of "Add me to your email list".